Abstract: Getting an new processed product off the ground requires good partnerships, and innovation to resolve bottlenecks encountered along the way, which requires facilitation and subsidization of unexpected costs. A study by International Potato Center showed that bread made off 35% Orange Fleshed Sweetpotato Puree mixed with 65% wheat flour is widely accepted by customers, even consumers were willing to pay 10% price premium for OFSP bread compared to wheat flour bread. 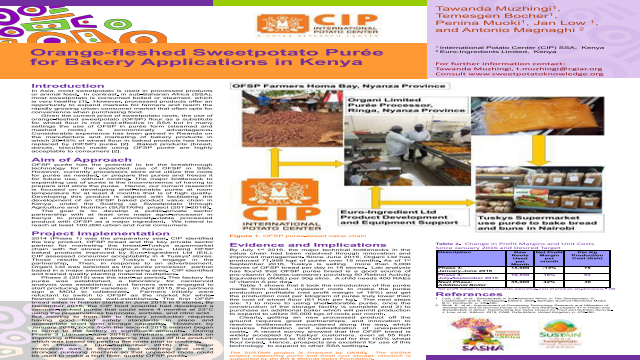 Hence, prospects are excellent for use of OFSP puree technology to expand the use of Orange-fleshed sweetpotato and reach wider urban consumer with nutritious bakery products. Summary: Orange-fleshed sweetpotato bakery product found to be economic profitable business in Africa and the demand for such nutritious products is expected to expand. References: Low, J.W., et al., Sweetpotato in Sub-Saharan Africa, in The Sweetpotato, G. Loebenstein and G. Thottappilly, Editors. 2009, Springer Science+Business Media B.V.: Dordrecht. p. 359-390. Sindi, K., et al., Improvement of Processing Technology Research and Utilization of Sweetpotato and its Derived Foods in China and Rwanda, Chapter 47 in Potato and Sweetpotato in Africa: Transforming the Value Chains for Food and Nutrition Security, J. Low, et al., Editors. 2015, CABI: Oxfordshire, United Kingdom. p. 478-490.